Muskerry News | Blarney cooks don’t spoil broth! The Schools Cookery Final took place at the Macroom Food Festival at the end of last month. There were 6 teams in the final and Scoil Mhuire Gan Smal, Blarney, were represented by Nicole Barrett and Aoife Osborne. 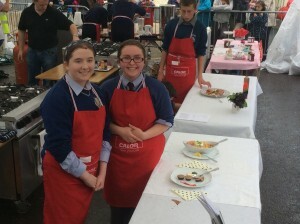 The competition required that you use local and Irish produce, and on the day the girls cooked a beautiful dish of creamy salmon with cherry tomatoes and spring onion, and a temping dessert of triple chocolate cups with raspberry coulis. All produce was sourced locally, with the chocolate coming from the new Blarney Chocolate Factory.